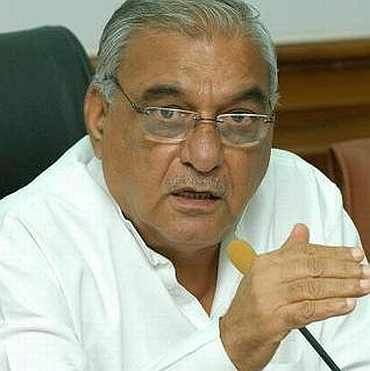 Haryana Chief Minister Bhupinder Singh Hooda on Friday equated Khap Panchayats with organisations like Non-Governmental Organisations, saying that they are part of state's culture. "Khap Panchayats are like NGO as we have Resident Welfare Associations... they are part of our culture," Hooda said, while addressing media in Chandigarh after holding a cabinet meeting on Friday. He was responding to Finance Minister P Chidambaram's recent statement calling Khap Panchayats a retrograde organisation, saying, "It is not part of India's culture". Asked about whether the interview of Swami Aseemanand done by Caravan magazine in Ambala jail was in accordance with the law, Hooda said jail authorities must have given requisite permission for the same. "Necessary permission must have been given (for interview) by jail authorities... permission could have been given to advocate," Hooda said in his reply. The Caravan magazine had claimed that its reporter had interviewed Aseemanand inside Ambala jail during visiting hours for over two years. It had claimed that Swami Aseemanand had accused top leaders of Rashtriya Swayamsevak Sangh, including chief Mohan Bhagwat, of knowing his terror plots and had approved them. Hooda further said that Congress vice-president Rahul Gandhi would visit Ganaur in Sonipat district on February 11 to seek and incorporate views and suggestions of farmers coming from several states in the Congress' election manifesto for coming Lok Sabha elections. Rahul would also lay foundation stone for a horticulture market coming up at Ganaur, he said. Asked about the state budget, Hooda said the state government would present a full budget during the coming assembly session starting from February 17. "There is not going to be any vote on account. We will present full budget," Hooda said, adding that it would be for common man and the farming community. Asked whether he was invited for Punjab government's upcoming agriculture summit at Mohali, Hooda said, "Haryana has highest yield in agriculture... (it) is self sufficient." Mohan Bhagwat: The mastermind, or the target?